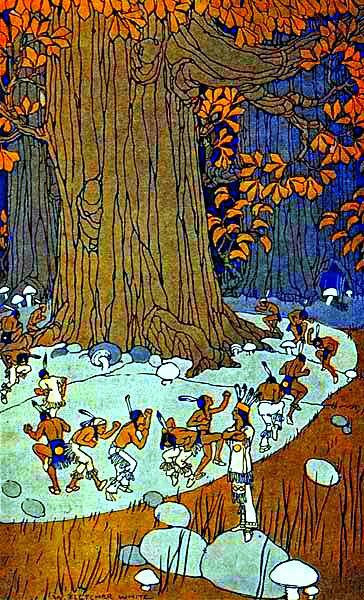 Mason Winfield has observed that Iroquois and Algonquin informants today generally speak of two distinct classes or tribes of “little people,” whom he designates “Healers” and “Tricksters.” The former are more magically potent and more beneficial to mere mortals. The latter are the ones most likely to interact with humans—especially children—but they are also more mischievous, if not outright malevolent. This all got me wondering if the same typology might work in more southerly Native American cultures. This post, then, is going to be a ridiculously brief summary of my preliminary findings. I should also say up front that I am a complete and utter amateur and I know it! I’m sure there are details I’ve missed because I didn’t even know to look for them, and I welcome any constructive criticism. At the outset, I should explain that “little people” seems to function in many Native American languages as a shorthand term for any sort of supernatural or uncanny humanoid. It is thus comparable to the way “troll” is used in later Scandinavian folklore. Even something like the “Deer Woman” can be called one of the “little people.” The Creeks even have a type of little people that they call the “tall people”! Size, therefore, seems at best a secondary concern—although, in fact, most of the beings we’re about to discuss are unusually short. With that said, let’s get underway. I expected to find a better fit with Winfield’s two-tribe model in Cherokee folklore than I did. They do, after all, speak an Iroquoian language—although they have been separated from their northern cousins for thousands of years. There is definitely a two-tribe model in place among the Cherokee. They speak of a more powerful and more benevolent race called the nunnehi, “people who live anywhere” and a more morally mixed group called the yunwi tsunsdi, “little people” properly so called. The nunnehi are not, though, strongly connected with growing plants or providing medicine. In other words, they don’t obviously fit Winfield’s “Healer” classification. I say they are not strongly connected because Donald N. Panther-Yates (The Eighth Arrow [Standing Bear, 2007] 42) asserts that nunnehi is a term not only for the “little people” but for those who commune with them: shamans, healers, medicine men, etc. So there is at least a passing association with healing roots, herbs, and so forth. But this doesn’t often find its way into the popular legends. Rather, the Cherokees tell stories of nunnehi caring for lost travelers or perhaps showing up unawares at dances or other festive occasions. Sometimes they are depicted as fierce warriors who emerge from the ancient mounds to defend the Cherokees from invading armies. The Rock Clan is the most malicious, quick to get even when offended. Some say they are like this because their space has been invaded. Like many types of European fae, they are known to steal human children. The Laurel Clan is generally benevolent, humorous, and joyful. They are also mischievous, however, and love to play tricks on the unsuspecting. The Dogwood Clan is the most favorably disposed to humans, though they are also stern, serious, and prefer to be left alone. I’m considering here not only the Muskogee (or Creek) proper but groups that spoke closely related languages such as Seminole, Mikasuki (Miccosukee), etc. The Muskogee were close neighbors of the Cherokee in Georgia and South Carolina, and there seems to be at least a little bit of overlap in their beliefs about the little people. Like the Cherokee, for example, they populated the ancient mounds with invisible “ghost warriors” who might be heard dancing or singing in the early morning (James Mooney, Myths of the Cherokee  475). Unfortunately, the Muskogee rarely talk about these beings. They aren’t nearly as prominent as their Cherokee counterparts, the nunnehi. 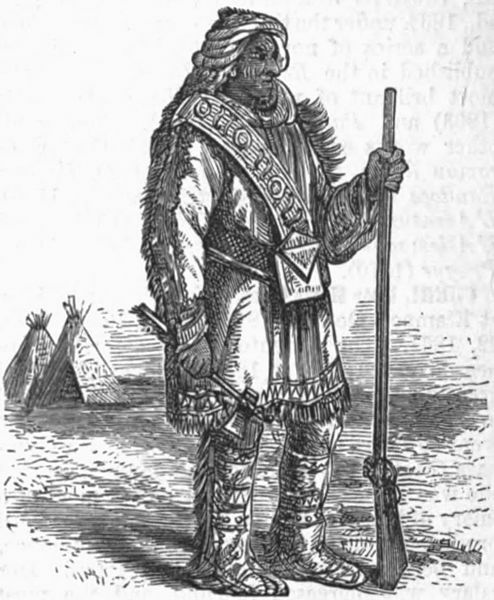 There is, however, another type of little person who bears an even stronger resemblance to Winfield’s “Healers.” Especially among the Seminole and Mikasuki, one finds reference to a benevolent dwarf or little person who provides plants that are vital for human well-being. Among the Mikasuki, this dwarf is called Fastachee, “little giver.” Fastachee is a provider of both corn and medicinal herbs. So once again, we’re in the realm of little people who make plants grow. This figure is far different from the este lopocke (or este lubutke). According to Jack B. Martin and Margaret McKane Mauldin’s A Dictionary of Creek/Muskogee (University of Nebraska Press, 2000), these are “little people (said to cause people to get lost in the woods)” (266). When tormenting hapless travelers is part of your dictionary definition, you are definitely in the “Trickster” category! These little people are virtually identical to the yunwi tsunsdi of the Cherokee. Like their Cherokee cousins, they are divided into a number of separate clans or tribes, some of which were definitely worth avoiding! Summary: The two-tribe model is clearly at work here, with both well defined “Healers” and “Tricksters.” Overall, however, the Muskogee seem to have a more optimistic outlook than the Iroquois. Even the “Tricksters” have a positive role to play. [I]f he accepts the good herbs, he is destined to become a great doctor and an important and influential man of his tribe and win the confidence of all his people. When he accepts the good herbs the three old spirits will tell him the secrets of making medicines from herbs, roots and barks of certain trees, and of treating and curing various fevers, pains and other sickness. The function of the Little People is similar to the function of the fairies of Europe; sometimes to the Bogeyman of America. There are stories we were told when we were younger—that the Little People would come from the earth and swallow us up if we weren’t good. Once again, we see the idea that the little people are to be feared—or at least treated with delicacy. We also see them paying particular attention to children: serving as a threat to make them behave. In addition to the spirits of the animals, there were other creatures who lived in the forest but were not as easy to see. Perhaps the most important of these were the “Little People.” The Little People would sometimes help those in trouble or play tricks on those who offended them. They interacted most often with children. Sometimes a child would be chosen to live among the little people for a while. During this time the child would be given special powers of healing. When the child grew up, he or she would become a healer or herbal doctor. Healers could not teach or impart their skills to others because their magic came from the Little People. I can’t recall too many specific examples, but the impression I have is that there were rules–I guess you’d call them—of one kind or another for almost every situation. And breaking or ignoring the rules often had serious consequences. My sisters and I understood that we were never to leave our playground the way we found it. We had to change it in some fundamental way before we left. If we didn’t, the little people could gain access to it and us and do some sort of mischief. They could play tricks on us, but the tricks weren’t fun. We were told that some of the little people could harm us, and of course, we were afraid of them. So we were very careful about the rules. I never saw the little people, but there was no question among us that they existed. At some point in my childhood, I was told that only people born with the special powers of an Indian doctor could see little people. Though I couldn’t see the little people, anybody could see signs that they had been about. Having rescued, cared for, and fed their guests, the women then warn them to flee as fast as possible “because their husbands were fierce men and cruel to strangers” (Morse, 726). These husbands were said to be of gigantic stature. They are hairy, aggressive, barely civilized wild men. For their part, however, the “daughters of the sun” are beautiful nymph-like beings with dark eyes and musical voices. They often appear in thin, clouded forms, and have been compared to angels. The idea of beautiful, helpful women married to terrible ogres seems to be an almost universal trope in fairy tales. This is but another variation on that theme. This mysterious creature has a counterpart in Cherokee folklore named Awi Usdi or “The Little Deer.” In ancient times, Awi Usdi advocated for deer-kind with humans by appearing to them in their dreams, urging them only to hunt as much game as they needed to survive and to perform certain hunting ceremonies to acknowledge their indebtedness to the deer for its meat and even ask its forgiveness. When hunters were careless and did not perform the required rituals, Awi Usdi used his magic to afflict them with rheumatism. The wolfish head and comparisons with a horse or a mule lead me to wonder if perhaps some species of mesonychid (like the Sinoplotherium pictured above, but with long ears?) would be an appropriate stand-in for this creature, should it ever find its way into fiction. Swanton mentions, with little description, several water beings. Among these are the water bear, water calf, water bison, water tiger, and water person. The last of these, the water person, was described as about four feet tall and having long hair. Also mentioned by Swanton with little description are Wiofû’tc miko (water king deer), which caused certain diseases, and a Spirit of War that appears to have been in human form. The horned serpent is a creature of chaos, the underworld counterpart to the “thunderers” or “thunder beings” who represent order and live in the sky. Beyond that, there are some distinctions between the Cherokee and the Creek horned serpent. In Cherokee mythology, the word for horned serpent is uktena. These malevolent and deadly monsters inhabit deep underwater pools as well as the high mountains. An uktena is as large around as a tree trunk. Its scales glitter like sparks of fire. It has horns on its head, naturally, and a bright, diamond-like crest on its forehead. This crest is greatly prized, as one who can retrieve it is supposedly imbued with the power to become a great wonder-worker. This is a dangerous quest, however, because the uktena’s dazzling appearance draws people toward the creature when they should be running away. For the Creeks, the story is pretty much the same, though their horned serpent does not seem as outright evil or destructive as that of the Cherokees. It might even appear to wise young men. The Creek horned serpent is a huge creature armed with crystalline scales, with an extremely bright crystal adorning its forehead. As with the uktena’s diamond crest, this crystal is said to grant mystical powers to whoever might retrieve it. 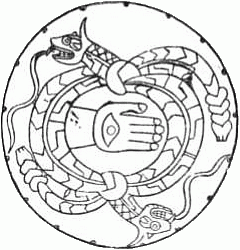 The Creeks have another supernatural serpent called the tie snake, and accounts differ as to whether they two are the same or whether they are, in fact, distinct creatures—though sometimes called by the same name. I’ll tackle tie snakes in a later installment. The nunnehi are the principal Fair Folk of the American Southeast. They are helpful spirit warriors who dwell in rocks and hills. They prefer to live on the tops of mountains and hills. Like the daoine sídhe of Ireland (and many other Old World fae), they are said to enjoy dancing and music. It is said that, the closer one came to singing nunnehi, the farther away they seemed to be. They were able to become invisible at will, but when they permitted themselves to be seen, they looked exactly like other Native Americans. They wore traditional Cherokee clothing and spoke the Cherokee language in the Overhill (i.e., Tennessee) dialect. The Cherokee name for these beings can be rendered nunnehi, nvnehi, or gunnehi. Whatever the form, the name means “people who live anywhere.” The singular form is nayehi. The Creek also describe an ancient battle in which their warriors emerged from a mound and defeated a Cherokee war party—an exact parallel to similar legends told by the Cherokees themselves about the nunnehi who lived beneath Nikwasi Mound near Franklin, North Carolina. The nunnehi are generally quite hospitable to mortals, especially those who are in trouble. There are a number of stories of nunnehi helping lost travelers and returning them safely to their homes. In 1838, it is said, the nunnehi invited members of the Cherokee nation to retreat to their domain at Pilot Knob, North Carolina, and thus escape forcible deportation to Oklahoma. 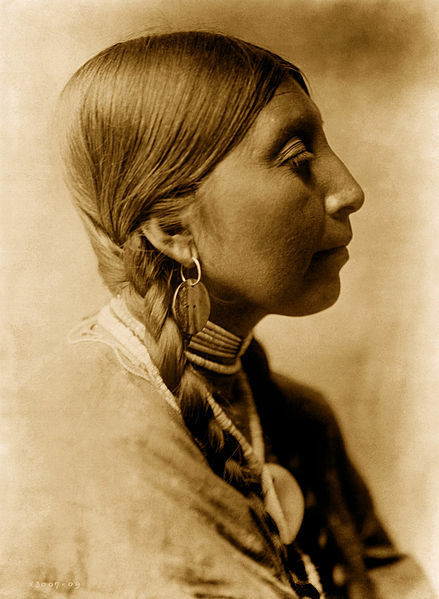 Other nunnehi are said to have migrated to Oklahoma as a sort of vanguard for humans forced to walk the Trail of Tears.